Packing up is not an option, but finding a quality pest control service is. How can you go about doing so? When searching for the services of a pest control company, be sure to check out the following tips below. Is your pest control company of choice insured? Most important of all, did you check if the pest control company of choice is insured? Never make the mistake of assuming that every service you call will be licensed or insured in the state you live in. You do not want to be sued for damages if one of the exterminator injures himself on your property. Contact their references if you aren’t sure. You can also put your shyness aside and ask the neighbors to refer you to an insured pest control service. If they refer you to a pest control service that has a positive reputation in the neighborhood, get up and contact them. 2. Is it a reputable service? A reputable pest control service might have a website. Visit it and look for the testimonials and keep a good lookout for any negative ones. You can also look for reviews on Internet directories if a service does not have a website. You can definitely find reviews on Google once a thorough search is performed. Consumers love to rant about their displeasure or positive experiences for the services they hire online. 3. What products do they use? When you call a pest control service, make sure that you ask them about the type of pesticides they use. The one size fits all policy does not fit in pest control. You cannot expect to eliminate rodents from the same bug spray you use on cockroaches. If the service you call uses the same pesticide for most of the pests that they are called on to eradicate, it’s best that you keep looking for a service that adopts a personalized approach to every infestation. When it comes to service providers, cheaper rates do not always mean better services. Pest control services may try to attract more customers by claiming to offer cheaper services than their competitors. What pest control methods do they use? However, such extermination packages might not have everything your home needs at the moment. Of course, a good pest control service is always willing to work around your budget. If a service agrees to do so it’s a keeper. 5. Do they provide regular reports? Extensive exterminations like tent fumigation call for regular reports. Ask the pest control company you call whether their employees keep customers updated on the progress of any extermination, especially if you are on a tight schedule. You might have to ask if you’ve just relocated to a new city during a job transfer and don’t exactly relish the notion of staying in a motel room for long. Ask for a time limit. The service will probably have to send over someone to check the extent of your infestation. See that they do. This is the only way they will be able to tell you how long the whole process is going to take. Speaking of employees, it would serve you well if the service you eventually hire trains its staff on professionalism. Do they keep you on hold long? Do they keep you updated on your home’s progress? Do they have a history of delivering on their promises? Are the pest control specialists in proper uniforms? Are all of their products properly labeled? If a pest control service ticks all of these requirements, hire them immediately. In addition, a pest control specialist must also agree to walk you through the extermination process before he begins. This might include a description of the types of treatments he will use and how they will be used. Ask the extermination service you call about how they usually conduct themselves during such situation. This will give you an idea about their competence and level of expertise. If the guy at the other end of the line has a habit of slurring his words or seems like he doesn’t know what he is talking about, it’s best that you hang up and try another service. 7. How do they handle recurrent infestations? 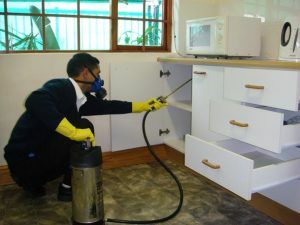 A good pest control service knows that infestation can be recurrent. Some pests like bed bugs can go for months without feeding and wait for their next meal ticket. You must only agree to sign on a service that promises to come back the moment you suspect another possible infestation. Most reputable services agree to visit homes that they have already serviced on a monthly or quarterly basis. You can discuss your problems with them then. The pest control industry has come a long way from simply spraying homes with pesticides. Pests have the tendency to develop immunity to pesticides if they get used to them. 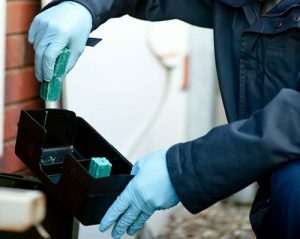 A reputable pest control service should know this and should keep updated in this regard and be flexible enough to adopt appropriate techniques or products that will make it possible for them to overcome such challenges as they arise. You cannot afford to have a pest control “specialist” throw up his hands in sheer frustration and yell, “I give up” and return your money just because your pest problem keeps coming back after every few months. Remember, it is best to be safe rather than sorry when it comes to selecting a pest control company that you can count on. The integrity of your home and your comfort depend on it. Thanks for this helpful post on how tho choose a pest control company. I am thinking that it is getting to the point in my house that I am going to need pest control. I really like what you said about making sure that the company is insured. I also like what you mentioned about checking what they do for recurrent infestations. Thanks for the help! I completely agree that cheaper rates don’t always mean better service. That’s something that can be applied to almost any investment. When it comes to pest control, that’s something I don’t think anyone should ever try to save money doing. Most definitely. When treating pests, you have to invest big. Awesome overview here on picking a reputable pest control company. Great information. I have been a pest control service provider for years now, and always tell people to do their own due diligence when they are looking for my services. Great information. Yup. Choosing the right pest control company is very important. It could even affect the results you get. I agree that you would check to see if a pest control company updates you on your home’s progress. I would imagine that knowing how the process is progressing would be really helpful. I’m looking for a pest control company for my home so I’ll have to find one who will keep me updated. 100% agree with this article. Homeowners need to be aware that even though companies or individuals state that they’re licensed and insured on their website, it doesn’t always seem that way. Thank you for the your valuable insight. When it comes to educating homeowners on pest control you are the best I’ve seen. I agree also. You have a lot of great points and it would be very difficult to come up with an argument. I want to make sure that I get the mice in my home taken care of. It makes sense that the first step would be finding the right person to take care of it! I’ll look for someone who uses products that are friendly to my home. Considering that some pests will always find a way back it is good to know how the pest control company handles this. If they don’t acknowledge these recurring pests then it is best to find another company. Most good pest control companies will try to come up with some kind of plan to come by every couple of months and check for/remove the pests in question. This is definitely the case. A single attempt will never be able to completely get rid of pests. It is good to know that one should make sure to ask pest control companies about the type of pesticides they use. I did not know that the one size fits all policy does not fit in pest control. If you have pets, it would be a good idea to ensure that the solution used is pet friendly. Your comment on how you cheaper isn’t always better with pest control was interesting. I agree that sometimes it is important to spend a little more in order to find a service that will do a good job. My sister in law needs a pest control service in her home so she’ll have to find one that is fairly priced. Love this article. Pest control is something I have been battling for years. I’ve noticed a lot of ants in my kitchen, and I don’t want to risk an infestation. It makes sense that I would want to find a pest control company that uses good products! That way I know that they will have the proper tools needed to get rid of them. I think your suggestion to look at testimonials to determine how reputable a pest control company is would be a good idea. I know I’d only want a reliable company working on my pest problem if I were to have one. I know my sister-in-law has been having some problems with spiders, so I’ll make sure she does her research to find a reputable company. I like how you say that you would want to find a pest control service that will offer long-term protection. It would seem smart to find someone who is able to provide this type of service because it would show they care. I have some mice in my crawl space I would like to get rid of, so I’ll have to find a service that offers long term care. Thanks for the read. You mentioned that you should find a service that would be willing to come back out and help if the pest issue resurfaces. Especially if you are dealing with a pest that really causes problems to your infrastructure or general health, having that support would definitely provide peace of mind. A friend of mine has been looking for a pest control service, so I’ll be sure to advise they look online for reviews that show a service with these kind of qualities. I’m glad you mentioned asking about if they come back if there are still bugs around. I have been wanting to get pest control, but I didn’t know if they come back. In case some bugs survive I’d like to find a company that will return to take care of them. Thanks for the advice! We have rats! How is that even possible. We are hoping to find a rat pest control company as soon as possible. Thanks for pointing out that rats require different pest spray and other tools to get rid of an infestation. Thanks for the tips, so we can find the best company. Our house is starting to be infested with ants, and we would like to get it taken care of. I like how you pointed out that when it comes to choosing a pest control company that we should look at the different price range. It will be nice to find a company that can do the job at a good price, and have it done right. That sounds really nice that a pest control specialist will go through the extermination and removal process before he or she begins it. My home has recently been suffering from an ant infestation. I’ve tried DIY, but they just keep coming back, and I swear I have no food sitting out for them or anything. It sounds like professionals are the right way to go, so I’ll have to find a pest control company to come out and get rid of those ants. Professionalism really is one of the biggest things you need to look for when choosing a pest control service. After all, you will be inviting them into your home to deal with the unwanted pests. Because of this, you want to make sure that they will treat your home with respect and care while they go about their business. My wife and I are having a pest problem in our home right now and are thinking of hiring a pest control company. I like that you suggest finding a company that is diligent and will work until the pests are gone. It’s true that bugs can develop an immunity to some controls so having someone that will return and ensure the job is done would be ideal. Thanks for the help. My wife and I just moved and noticed a lot of bugs have been infesting the basement so we’re looking into hiring a pest control company. I like that you suggest asking for a time limit so someone will take a look immediately, especially if you just moved. If they are quick and reliable then I say they can be trusted to get the job done! Thanks for sharing. We’ve been having such an awful time with bed bugs, lately! I’m glad you talked about finding a diligent company because without one, we are never getting rid of this problem. I’ll have to ask them what their policy is for coming back multiple times to make sure the bugs are gone. Thanks for a great post! I like how you suggest finding a pest control company that is reputable. My husband and I just moved into a new area, and many of our neighbors have warned us about termites being a problem sometimes. We want to have a professional pest control company inspect to see if we have a problem, so we’ll make sure that the company we choose has a good reputation. Very Interesting. Thank you for providing great insight into choosing a pest control company. I like what you say about looking at testimonials first. It’s good to know that others have had a good experience with the work they’ve done. Looks like we’ll need some pest control with all the spiders I’ve seen lately. I’ll make sure to see what others are saying before I hire someone. I like your suggestion to ask how they handle recurrent infestations. If I’m hiring a company to remove pests I want to make sure that I don’t have continual issues. I’ll make sure to ask this question in the future.